River Valley sophomore Hannah Jacks (2) goes for a layup over Southern junior Phoenix Cleland (right), during the Lady Raiders’ non-conference win on Dec. 1, 2018, in Racine, Ohio. Meigs freshman Mallory Hawley (32) glides in for a layup, during the Lady Marauders’ win over Gallia Academy on Dec. 8, 2018, in Rocksprings, Ohio. A total of 10 local girls basketball players — seven from Meigs County and three from Gallia County — were selected to the Ohio High School Basketball Coaches Association District 13 teams. Locally, Meigs and Eastern garnered the most spots with three players listed in Division I-II and Division IV respectively. Gallia Academy, River Valley, South Gallia and Southern earned one spot apiece on the 2019 District 13 list. For the Lady Marauders, Kassidy Betzing was named co-Player of the Year in Division I-II and claimed her second career first team nod. Betzing also has a pair of second team selections on her career résumé. 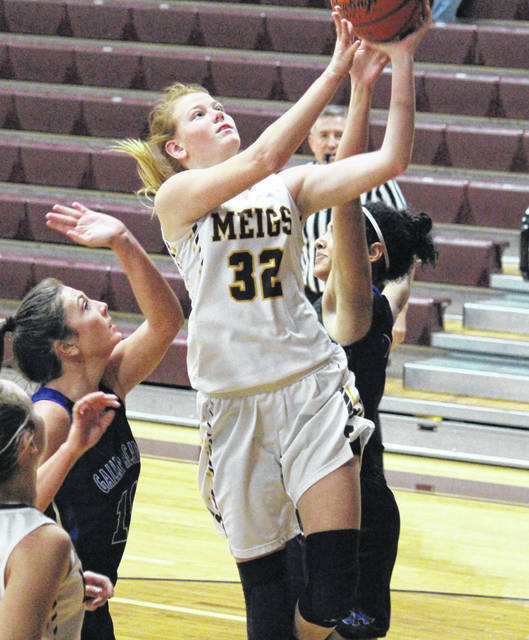 Betzing is joined by a pair of first-time all-district honorees for Meigs, as freshman Mallory Hawley was on second team and senior Becca Pullins was named special mention. 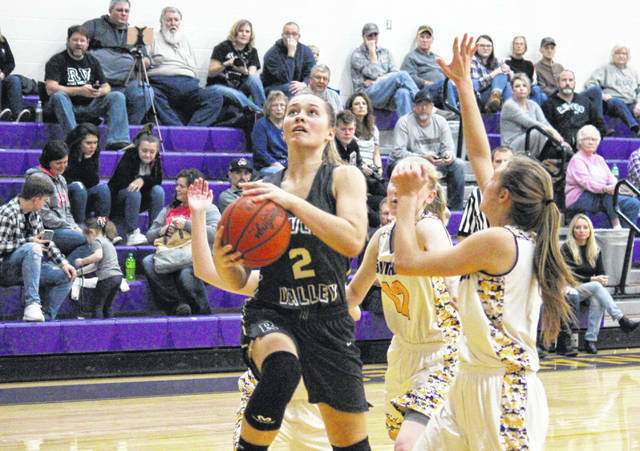 Also in Division I-II, Gallia Academy and River Valley each had one selection, with GAHS sophomore Maddy Petro and RVHS sophomore Hannah Jacks both landing on second team. This is the first career All-District 13 selection for Petro or Jacks. On the Division IV first team, Eastern was represented by seniors Jess Parker and Alyson Bailey. Another EHS senior, Kelsey Casto, was named to the special mention list. Parker was a second team choice last season, while Bailey and Casto are newcomers to the list. Also in Division IV, South Gallia’s lone selection was freshman Jessie Rutt, and Southern’s only choice was junior Phoenix Cleland. Both Rutt and Cleland are on the District 13 times for the first time. Betzing shared the Division I-II Player of the Year award was shared Vinton County’s Morgan Bentley, while the Coach of the Year award went to Lady Vikings’ head coach Rod Bentley. In Division III, the Player of the Year was Rachel Richardson and the Coach of the Year was Jeff Grinstead, both of whom represent Alexander. The Division IV Player of the Year was Waterford’s Rachael Adams. The Division IV Coach of the Year went to Lady Wildcats coach Jerry Close for the fifth straight year, winning the award outright for the fourth time in that span. Morgan Bentley, Vinton County; Kassidy Betzing, Meigs; Hannah Kroft, Marietta; Laura Manderick, Athens; Molly Grayson, Warren; Tegan Bartoe, Vinton County. Maddy Petro, Gallia Academy; Hannah Jacks, River Valley; Beth Starlin, Logan; Olivia Alloway, Warren; Mallory Hawley, Meigs. Cameron Zinn, Josie Ousley (Vinton County); Katelyn Webb (Jackson); Morgan Altenburger, Api Hill, Tia Jarvis (Marietta); Emma Harter, Kaylee Stewart (Athens); Becca Pullins (Meigs); Sommer Saboley, (Warren). Rachel Richardson, Alexander; Allie Marshall, Fairland; Caitlyn Brisker, Oak Hill; Addi Dillow, Coal Grove; Emilee Whitt, South Point; McKenna Rice, Alexander. Kelsie Warnock, Fairland; Mary-Kate McCulloch, Nelsonville-York; Haylee Stevens, Ironton; Emilee Carey, South Point; Sydney Mullins, Wellston. Mackenzie Hurd, Haley Hurd (Nelsonville-York); Maddie Ward, Karli Davis (Chesapeake); Brittany Thompson, Harlie Lyons (Fairland); Baylee McKnight, Destiny Dolen, (Coal Grove); Tory Doles, (Wellston); Rileigh Morris (Rock Hill). Rachael Adams, Waterford; Paige Tolson, Federal Hocking; Kyna Wadaker, Belpre; Jess Parker, Eastern; Ashley Spencer, Miller; Alyson Bailey, Eastern. Cara Taylor, Waterford; Rachael Hayes, Symmes Valley; Bella Whaley, Ironton St. Joseph; Emma Beha, Federal Hocking; Faith Mahlmeister, Ironton St. Joseph; Taylor Sells, Symmes Valley. Jayne Six (Trimble); Emily Kern (Waterford); Kylie Tabler (Federal Hocking); Abbey Lafatch, Sydney Spencer, (Belpre); Kelsey Casto (Eastern); Laiken Imler, Skylar Moore (Trimble); Jessie Rutt (South Gallia); Phoenix Cleland (Southern).